The Reebok Deck enables you to perform effective cardio workouts based on aerobic stepping, plus it can convert into a flat, incline or decline weight bench. When used as a step the decks height of 20.5cm is ideal for low impact aerobics. To increase the intensity, simply use the integral risers to elevate the deck to 35.5cm. 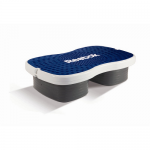 The Reebok Decks natural inertia and non-slip rubber surface makes the Reebok Deck very stable and safe during use. Pods up or pods down? 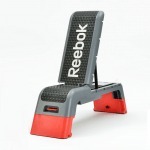 The navy and white Reebok EasyTone Step provides a unique total body workout to help tone and tighten muscles. This is not just your usual step. As a multi-purpose functional training platform, a diverse range of exercises can be performed and the balance pods create natural instability to force muscles to adapt. The EasyTone Step can be used with the pods facing up or down, and the adjustable air transfer between pods allows you to tailor the intensity of your workout. With your Reebok EasyTone Step you’ll receive a free DVD to lead you through an extremely rewarding and beneficial new fitness experience, plus the fundamental pump. Variety in training is the key to progress and with the Reebok Aerobic Step, no two workouts are ever the same. This is the ideal platform for group classes to perform a large range of basic and more complex exercises from cardiovascular and plyometric training to lower body muscle toning; its versatility is ideal for mixing up any workout programme. 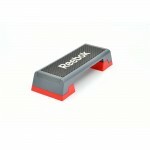 Suitable for all abilities and fitness levels, the red and grey Reebok Step can be combined with mat work exercises, or used with hand, wrist or ankle weights for an even higher calorie burn. Popular in gym class settings, the step is often used in conjunction with choreographed routines to upbeat music. Sturdy and durable for every lunge and jump, the Reebok Step’s non-slip rubber surface means the user can focus on their form and positioning, plus it can be height adjusted from 15cm (5.9″) to 25cm (9.8″) in three increments for added intensity. The workout ‘bubble’ textured surface is large enough for fitness activities, but at the same time the step is compact and easy to store away when the class is complete – convenient and completely hassle free.